2) will I like this rose in my garden? In this blog entry, the first question is discussed and a future blog entry will address the second question. Will this rose survive in my garden? 1. USDA Planting Zones — the information in this blog is generally applicable to zones 8-10. 2. Sun Exposure and Day/Night Cycles— some roses tolerate shade and others do not, and the farther away you are from the equator, the greater the variation in the ratio of day/night hours. Always check the desired planting location throughout the day before planting (morning sun and and about 6 hours sunlight is good for most roses)—and check those locations in both mid Spring and mid Fall. The front edge of my house is on a nearly perfect NW to SE line; my front door faces SW and the backdoor faces NE. Taking into account the tilt of the earth on its axis, the perceived “path of the sun” (based on rotation of the earth) at my house is NE to SW in the summer and from ESE to WNW in the winter. Roses perform best with morning sun, but disease resistant varieties do just fine with afternoon sun. “Livin Easy” is both heat tolerant, and able to recover from bouts of black spot or downy mildew, so it is located at the front of the house (SW side, most intense light and heat in summer afternoons). Valentine is EXTREMELY heat and disease resistant, so it can be in that intense afternoon summer sun as well. The “Aunt Betty” rose, on the other hand, prefers shade in the heat of the day, so it performs and survives best on the NE (back door) side of the house (in fact, I have 5 thriving in the back yard, while the one in the front yard died completely). Bottom line—-location matters. You can test sun exposure by monitoring sunlight (present or absent) throughout the day during the late Spring/early summer and late Fall seasons (USDA zones 8-10). 3. Soil Quality–Roses will appreciate well-drained sandy soil, improved with organic matter (composted manure, composted mulch, etc.). Over time, shredded bark mulch keeps moisture in the soil and it will compost as well, further enriching the soil. 4. Water Availability— on one hand, roses love water–on the other hand, they cannot sit in water for long periods of time. When water “stands” in the same location for more than a few days, the soil loses oxygen and conditions become favorable for rotting. (We want this in the compost pile to break down the organic matter, but we do not want that around living rose roots. 5. Space Requirements of Mature Rose — Providing adequate spacing for larger roses gives the rose more opportunity for nutrients, water and sun exposure. The Aunt Betty rose, for example, will grow about 9 feet in any direction—the one planted 3 feet from the house was often damaged by winds causing branches to scrape on the house and created a darker area behind the dense foliage. Over time, the rose will die back. Extreme environmental conditions (poor soil, drought, etc) will test the rose’s ability to survive–and reduces the number of blooms on the plant. If mature rose size is 3 feet in diameter, my rule of thumb is to plant two such roses about 2 feet apart (the radius of the mature size–1.5 feet–plus about 1/4 the diameter). So, 5 feet in diameter, plant (2.5 + 1.25 ft) 3 3/4 feet apart (as measured at the center of each rose). Trim roses around Valentine’s Day— remove all branches with diameter smaller than a wooden pencil, for best bloom performance). The roses can also be trimmed back in late Fall if there was substantive growth from a rainy summer or early Fall. 6. disease susceptibility/resistance — rose pathogens can damage or destroy the leaves, the roots and the blossoms. One of my favorite roses — The Chrysler Imperial — has large, show, extremely fragrant blooms that repeatedly show up throughout the growing season; however, this rose is extremely susceptible to fungal blackspot on both the leaves and stems. Because I enjoy this rose, I give it a little help surviving. Chrysler Imperial needs full morning sun (due east) for help combating disease. Dropping too many leaves can test this rose’s ability to survive. 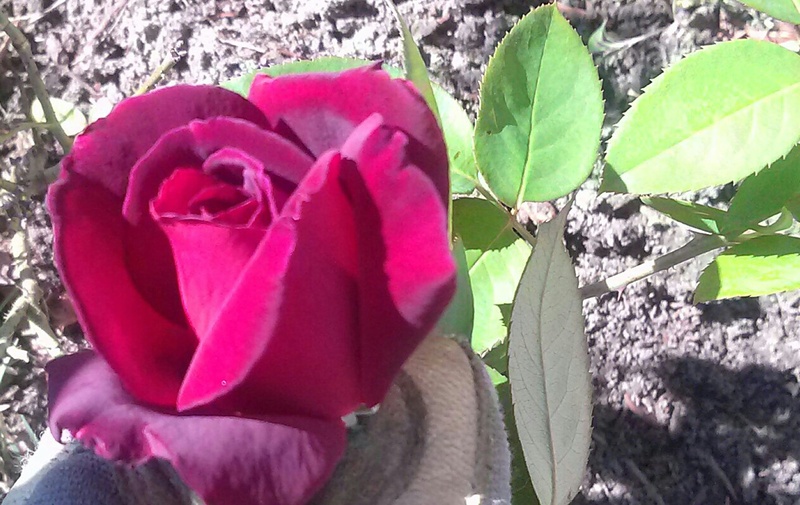 A thin coating of “safer soap” (not a pesticide, but is a barrier to the fungal pathogen) can help roses highly susceptible to black spot. If the plant completely defoliates and does not push out new leaves quickly, it may die. (Recall that “Livin’ Easy is resistant to black spot—that’s because it adds new leaves very quickly and can overcome a “normal” attack of black spot. Watch for repeated leaf drop (often during periods of high humidity and no morning sun) if you want to keep the rose alive. My next posting will address personal preferences and provide tips for answering the question; will I like this rose in my garden?